This Bitspower connector serves as a connector between a Wakü component with G1 / 4-inch female thread and a 10-mm inner diameter hose. The connection is particularly protected against leaks thanks to a rubber seal on the G1 / 4-inch side and allows the use of optional hose clamps on the hose side. The blood red finish looks especially cool and will leave a lasting impression on every viewer. What is the purpose of such a connection? For the connection of individual components of a water cooling, the choice of the correct connections and their sufficient number is essential. If the assembly fails or decelerates due to incorrect or too few connectors, the installation can quickly become a frustrating experience. Bitspower offers a comprehensive product range that offers the right solution for every requirement - whether adapters, direct hose connections, brackets or distributors. Each version is made of solid brass and has a sealing ring. Thus, the connections remain tight and ensure high long-term durability. 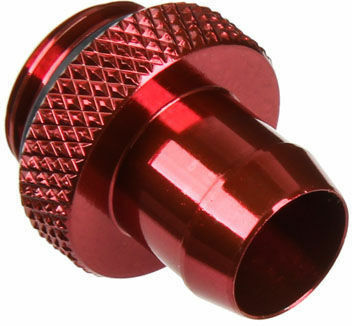 This is a G1 / 4 inch blood red port for 10 mm inner diameter tubing. This makes it easy to connect components of a water cooling system with a suitable hose. With a rubber seal, the G1 / 4 connector also has a high tightness. For safety's sake, the hose side should still be secured with a hose clamp (not included).